The low price of storage means it's feasible for most laptop owners to expand the capacity of their machines. But if you're going to the bother of installing a new hard drive, why not go one better and opt for a solid-state disk (SSD) instead? SSDs cost more than hard disks, but they have the edge in all other respects. SSDs weigh less and are more energy-efficient. With no moving parts, they're also less fragile, and they're virtually silent in use, helped by their reduced dependency on a fan. Performance-wise, going SSD can also pay dividends. A fast 2.5in notebook hard disk such as the Toshiba MK2554GSY can read data at around 58MBps and write at 56MBps. It has a random access (RA) time of 15ms - that's the time for the unit to ‘find' a randomly chosen piece of data. The fastest SSD we've tested so far was the Samsung 256GB SSD , which has a read speed of 175MBps and writes at 160MBps. Its RA is just 0.1ms. Even the cheaper Imation 64GB SSD used here reads at 136MBps and can be written to at about 88MBps. Its RA is 0.2ms. That's three times faster read times than the best hard disks, and 50 percent quicker writing speed. But making the switch to SSD isn't the only component change worth making. We also outline how to upgrade your Wi-Fi and RAM. Changing a laptop's hard drive needn't be traumatic - whether you're replacing it with another hard disk for increased capacity and faster performance, or trading up to a shiny new SSD, as we demonstrate here. But before you reach for the screwdriver, the following preparatory tips should ensure you don't encounter problems later. First, you need to decide whether to clone the contents of your old drive to the new one or reinstall your operating system (OS), applications and files from scratch. The former is a quicker process, but reinstalling everything to a virgin drive can result in a cleaner and more reliable system. Clone your hard drive: You can try one of several software options to make a complete copy of your internal disk, such as Acronis True Image HD, Paragon Drive Backup or Norton Ghost. Free apps are also available for Windows, such as Clonezilla. And for Apple OS X, try SuperDuper or CarbonCopyCloner. Follow the software's instructions to make a complete copy of the disk, either to your SSD mounted in an external USB- or FireWire-linked drive caddy or to a separate USB hard drive from which you can restore the contents to the SSD later. Install from scratch: To install a fresh copy of the OS, you really need the original installer CD or DVD. Unfortunately, not all Windows PC makers provide a bootable Windows install disc with your new PC. Instead, you may have to find the backup version on a hidden partition of the hard disk. From here you can restore your PC to factory defaults. While this saves fiddling with CDs and removes the chance of losing the all-important disc, it's no use if the ‘clean' partition is corrupted by malware or there's a hard-disk failure. And if you rely on the manufacturer's version of Windows, you may find a heap of time-limited demos and assorted bloatware, which usually only serves to slow Windows down. Either way, it may be worth contacting the retailer you bought your computer from, to see whether they can supply you with an original Windows install disc. Since you already own the licence to use Windows, a copy of Windows ought to cost no more than the disc it's supplied on. Also remember that you'll need to install proprietary drivers in order to get the laptop's hardware operational. For example, you'll need software drivers for the graphics, wireless and Bluetooth cards, ethernet port and sound system. These could be installed from a dedicated CD provided by the manufacturer, or may be available online to download from the support section of the laptop manufacturer's website. The added advantage here is that you'll get the latest versions of the drivers, potentially increasing performance and/or reliability. Even if you will be making a clean install of the OS and all your programs and personal files, it could still be useful to make a bootable clone of the current installation, if only to ensure you've got a copy of everything that's written to your hard drive. 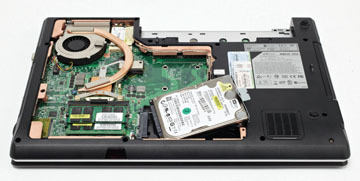 Internal affairs: Laptops aren't difficult to prise apart and start tinkering with, although doing so will often invalidate your warranty. Many have a variety of trapdoors and ad-hoc covers scattered over the laptop's underside, allowing you access to the upgradeable components. One of these will usually provide easy access to the hard drive. Before removing any screws, ensure you're grounded - any static charge you generate could cause harm to the delicate electronics inside your laptop. An electro-static discharge wrist-strap can be useful here, although it's easy enough to simply touch your finger on a grounded radiator from your seated position before starting work. Before opening up the case, disconnect the laptop's charger lead and remove the battery pack. Now look around for the screws that secure the bottom-plate cover above the hard drive. Remove these, taking careful note if they're different sizes. It can be useful to have a notepad to hand to keep notes of which screw came from which position. After removing the screws, place them in a small dish or saucer to make sure they don't roll off your work surface. The existing hard disk will typically be fixed to the laptop chassis by two or four screws, often attached via a separate lightweight cradle or harness. After removing the retaining screws, gently slide the drive away from the SATA edge connectors on one of its ends. 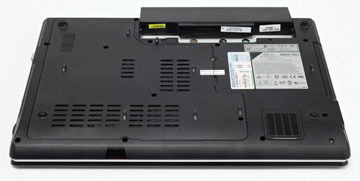 The laptop side of these electrical connections may be soldered to the motherboard, or there may be a ribbon cable attachment. With the old drive now free, remove the cradle if necessary and transfer this to the new SSD. 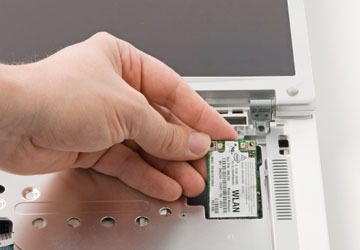 Insert the new SSD drive into the laptop, ensuring the SATA edge connector is firmly seated in place. Replace the drive hatch or laptop bottom cover and replace all securing screws.Now re-insert the battery power pack and connect the mains power supply. If you've already cloned your OS to the SSD before exchanging drives, your system should be ready to go when you power it up. If you didn't do so earlier, you'll need to clone the backup or original drive to the SSD. And if you decided to take the longer but more thorough route, you can prepare to reinstall Windows along with the rest of your required programs and files. If you decide to reinstall Windows, head to tinyurl.com/m9a7nb for advice. If your laptop seems to be getting slow, it's probably bogged down with files and a glut of programs that may or may not be of value - a proper maintenance and decluttering schedule is in order. If that doesn't do the trick, however, consider adding some more RAM - this will offer a significant boost and should sort out existing performance problems. 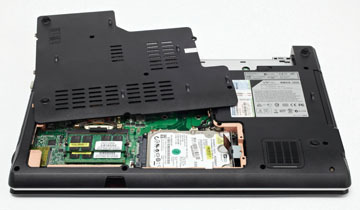 In fact, upgrading your laptop memory is the most cost-effective component change you can make. It's also a straightforward process. First, you need to establish what type of RAM your laptop can take (and how much) and what speed it can run at. You can mix and match old modules with new ones, but some systems may end up with better performance if you install a matched pair of identical dual in-line memory modules (Dimms). Swapping old for new: Power down the laptop and discharge any static from yourself and the machine. Now you're ready to go in. 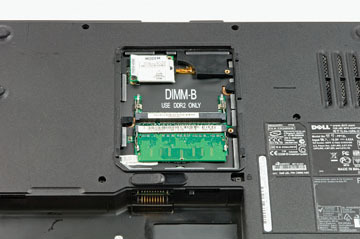 Most laptops have a panel on the underside - generally labelled ‘M' for memory - that conceals the Dimm slots for RAM. You'll have to undo a couple of screws to lift this up; on some models you may have to go through the rigmarole of removing the keyboard too. If you need to remove the keyboard, first take off the machine's hinge cover. This involves prying up the plastic casing - watch out for any recessed screws that prevent easy access. Next, detach the keyboard by taking out the two screws beneath the hinge cover that secure it. Lift it off and then unplug the connector that holds the keyboard in place. Ensure you put these screws somewhere safe, because you'll need them later when you come to reassemble your laptop. Next, you need to remove the old RAM module. Gently pull apart the metal clips securing each end. Once freed, it should pop up at an angle. Gently pull it straight out. Insert your new RAM in the same way, at an angle, until it's securely seated in the slot; then gently press it down flat. The holding clips should engage automatically. 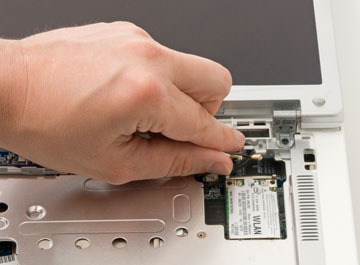 Replace the panel and battery, then restart your laptop. Your machine should automatically recognise the enhanced memory capacity.